In all religions you must first be touched with olive oil before becoming a member of the community. In the books of the old testament the olive and olive oil are often appointed: suffice it to say that the dove of Noah's Ark brought back an olive branch from Mount Ararat, Armenia mountain. This is dated 11000 BC and it was meant to be the sign that life was restored on earth after the “deluge”!! 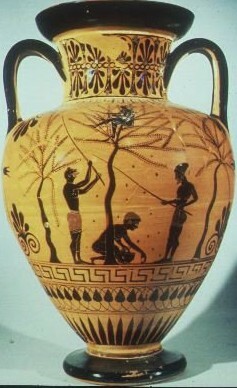 Olive oil was also the first prize in the Greek Olympian games . At those time is was based on Oleaster’s olives as the wild version of the current Olive Trees were richer of polyphenols with the related health benefits ( see Health section of this web site). In Greece there were many flourishing olive groves; particularly rich was Attica and in particular the plain near Athens. 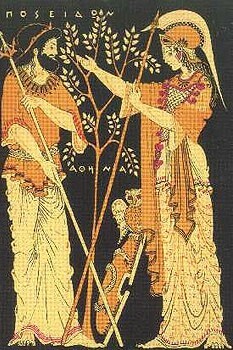 On the other hand the olive was the sacred plant of the goddess Athena and it was she who, in competition with Poseidon for possession of Attica, won by bearing an olive tree from her rod vibrated into the ground. In her honor is celebrated the holiday called Panathenaic, where athletes, who won the race received amphoras containing refined oil: this is a very particular form of amphorae, with paunchy body, short neck and small looped handles called like this for their particular use: panatenaiche. The olives demanded much care, that could be expensive, but the owners of olive groves were well rewarded for their hardships: not only the cuisine but also the bathrooms, games, gymnasiums and even funerals, required the use of large quantities of oil. In the Roman world no other condiment was used for cooking. Romans made the olive oil known in all Europe.